To reduce the amount of time spent in our office, bring in the “appropriate completed” PATIENT FORMS. 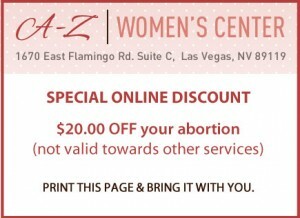 We recommend for you to eat something before coming to the office before your abortion. You should have breakfast if your appointment is before noon and you should eat breakfast and lunch if your appointment is after noon. We do not recommend heavy meals or eating on your way to the office (fast-food, drive thru). We want your food to have at least an hour to digest before coming into the office. Do not take unnecessary medications on the day of your procedure. If you take prescription medications for a medical condition, continue to take all medications as directed by your doctor. Bring all medications with you to your appointment. Do not wear any jewelry, including earrings, bracelets, rings, etc. Do not bring any valuables (expensive sunglasses, PDA’s, laptops, or large amounts of cash). We will not be held responsible for items left unattended in the waiting room or other areas in our office. Wear loose fitting, comfortable clothes and slip-on shoes. Do not wear complicated outfits. Make sure you wear regular underwear on the day of your procedure so you can go home wearing a maxi pad. No G-strings or thong underwear are suggested. Please do not bring children to the clinic. Expect to be in the office for 2 to 3 hours for your entire visit. Your ride may drop you off and return back to pick you up. We must have their contact numbers before you are called back for surgery. Due to limited seating in our lobby, please only bring one other adult with you to your appointment. We do not allow anyone to go back into the ultrasound room or in the OR during surgery. We accept cash, debit, and all major credit cards. The owner of the credit card MUST be here to sign and MUST present a valid photo ID. We do not accept checks, travelers’ checks, or money orders. We do not accept credit card payments over the phone. Payment is due before services are rendered. 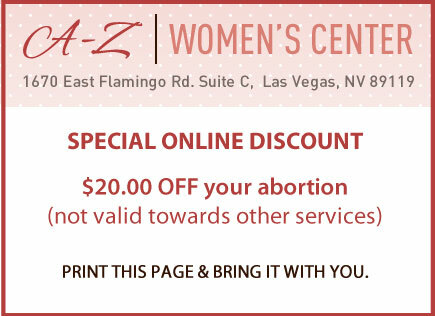 What if you are too early in your pregnancy to complete an abortion on the day of your scheduled procedure? We will refund everything you paid except $100.00. This money is for your ultrasound/and or laboratory testing. This money will stay on your account and you will not re-pay this amount on your next visit. We will repeat your ultrasound and laboratory testing when you return at no additional cost. Do not schedule work, school, or other commitments on the day of your procedure. When you will be able to go back to work will depend on how far along you are into your pregnancy. Most patients return back to work within 24-48 hours. Please ask one of the staff members for a discreet work note if needed.